Part of looking and feeling amazing in your hijabs is taking care of them. This includes cleaning and storing your hijabs in a way that will keep the fabrics and colours as good as new! Let’s be honest, we don’t clean our hijabs on a weekly or even monthly basis. Not that it is a good habit, but simply, this is what we do. Of course we do not want to over-clean our hijabs as we want to maintain the brightness of the colours and patterns. At the same time, cleaning your hijabs is an essential practice to protecting them from dirt, dust, sweat, and any other particles that could eventually break down their fabric. When cleaning your hijabs, you need to take into consideration the fabrics you are cleaning. Most often, your hijab will come with a tag and washing instructions. How you wash cotton blends is very different to how you wash silks and satins. What I have found best for cleaning my hijabs is the old-fashioned hand wash! I have found this to be a great way to wash all my hijabs and not worry about them tangling in the washing machine. I find that hand washing in a big container with a gentle de tergent and lukewarm to cool water helps get my hijabs smelling lovely and clean while keeping colours vibrant. If you do choose to use the washing machine, I suggest using the “gentle” or “delicates” cycle. You may want to use a delicates bag which is washing machine friendly. 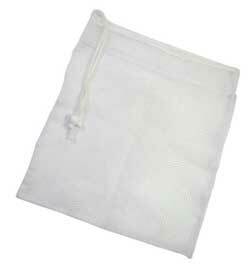 For those of you who do not know what this is, they are often used for washing bras and other delicates. It is a mesh bag with little holes, to allow the water and detergent to still wash the item while keeping it from getting ruined in the machine. There are a number of ways to store your hijabs and really it depends on your preference, and your space. I personally have taken over the closet in our spare room with my hijabs as I prefer to hang my hijabs. I came a cross this fantastic hanging scarf rack at Ikea. I have 2 of them and I think I need to go buy another one. It is so great because you can fit so many hijabs on there and still be able to see which is which. This also makes a SUPERB gift for a hijabi sister! The other option is of course folding your hijabs in a drawer. For this, be sure to line the drawer of any dresser with a piece of fabric. The last thing you want is for a little sliver to catch on to your precious hijabs and ruin the fabric. Also, do not be that girl that just throws her hijabs in the drawer and it becomes a haphazard mess! Fold them carefully and try to organize them by colour or pattern so that you can find the exact hijab you need as you are running out the door to face your busy life. For my very delicate fabrics, I choose to keep them in their bags folded in a drawer. There are some special pieces that you just cannot risk destroying in any way. For those, keeping them safe in their bags is your best option. For new scarves and accessories, visit www.ModernHejab.com.